Private terraces and balconies provide captivating views for guests of our 170 accommodations, including 163 guest rooms, three Junior Suites, three Executive Suites, and the Presidential Suite. Elegant eclectic décor comprises soothing tones, organic elements, and clean lines, which blend perfectly with the comfort of each Heavenly® Bed. Each Classic Room houses either one king-size or two twin beds, which are illuminated by natural light that streams in through tall windows overlooking the city or the golf course. A Deluxe Room has a larger living area, as well as one king or two double beds. Meanwhile, Classic Panoramic Rooms and Deluxe Panoramic Rooms are distinguished by their uplifting views of the pool, gardens, and mountains from their private terraces. Junior Suites are ideal for travelers who want more space, comforting amenities, and golf course views. Their open floorplans comprise a comfortable sofa, a dining table, and a bureau. Upgrade to a luxurious Executive Suite for separate living and sleeping rooms, plus pool, garden, and mountain panoramas. An Executive Suite can connect to a Deluxe Room. The Presidential Suite, the resort’s most opulent accommodation, ensures unparalleled experiences. The 155-square-meter terrace boasts an outdoor Jacuzzi and impressive panoramic views of the coast and the mountains. The luminous living room impresses with an elegant corner sofa and a dining table for up to eight people, and an open-concept kitchen is nearby sliding doors lead into the bedroom, where a king bed and a working desk await. The en-suite bathroom pampers guests with a Jacuzzi, a shower, a sauna, and tiles in brown and ochre tones. The Presidential Suite can connect to an Executive Suite; this combined suite can then connect to a Deluxe Room. Experience the views that our rooms boast to the golf courses and Andalusian coast with live feed images on our webcam. The Westin La Quinta Golf, Resort & Spa, offers golf lovers a unique location in the known as “Valley of Golf”. 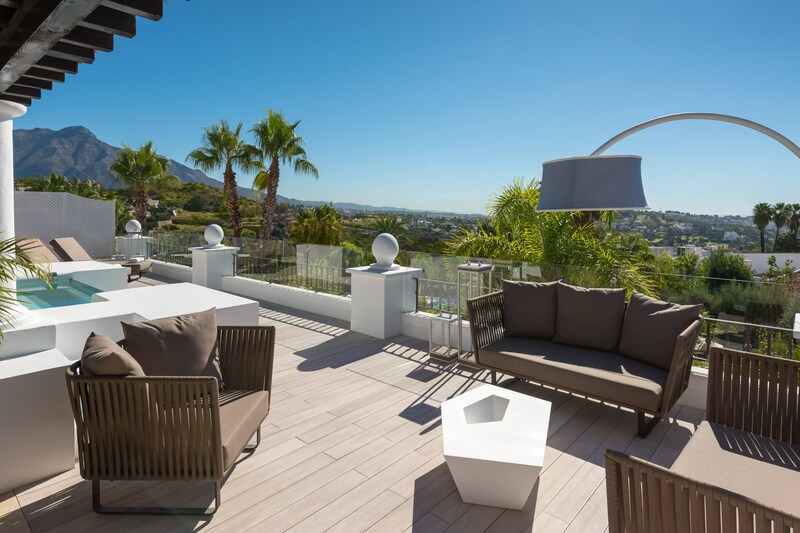 Located in Benahavís, between the Mediterranean Sea and the mountains of Sierra Blanca, a tranquil locality that is situated only 15 minutes from Marbella. Upgrade your stay in a room with stimulating views to the Andalusian coastline, authentic relaxation retreats ideal for recharging body and mind. Discover iconic Marbella views from our rooftop and get inspired for your next stay at The Westin La Quinta Golf Resort & Spa, Benahavis, Marbella. These are the experiences that restore wellbeing and even more so if they&apos;re enhanced with accommodation in our exclusive suites. Maximize your comfort in our large and elegant eclectic style suites, which include all that´s needed to live a unique experience. From the Westin Heavenly Bed®, that guarantees a deep restorative sleep, to private terraces with captivating views to the golf course, gardens, mountains and city.